We ask all band families to participate in music department fundraising to the best of their abilities. Thank you. Orders may be picked up Wednesday 11/28/18 at Sue Selland’s home. Reindeer item is in and may be picked up at Sue Selland’s home Monday 12/10/18 after school. Spartans Music Boosters has contracted with BHS athletics to work the athletic gates as a group fundraiser. Our group will earn $1500 for the general music fund by working all of the Fall, Winter, and Spring athletic gates. Please click this link (to come) to sign-up for dates you can volunteer. Thank you in advance for helping us earn money for the music programs at BHS! There are two types of fundraisers, individual and group, we will be using throughout the year to help support our band booster budget, trips and new items for the band. 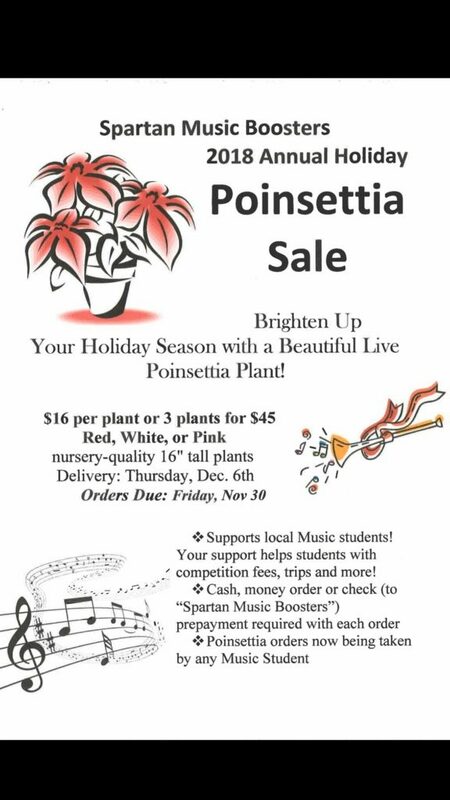 Students will earn funds in their individual student accounts which are maintained by the Spartan Music Boosters by participation in certain fundraisers. Student account balances may be obtained by contacting the Spartan Music Boosters Treasurer (treasurer@berthoudhighband.com). King Soopers reloadable gift cards are available year-round. Your gift card, received through the Music Boosters, will receive 5% back on all re-loads and is a simple way to put money directly into a student’s account. Cards can be used at the gas station or at the grocery store. Contact Suzy Bullett directly or comment here if you need one (or two!). For more information, please refer to this file: King Soopers Gift Card Fundraiser Info. Student account balances may be applied to fall band fees, parent t-shirts, student trip costs, solo/ensemble competition fees, honor band auditions & expenses, and approved educational musical activities. Students also receive lettering points for attendance. SnapRaise to come Fall 2017. Possible NEW opportunity in 2017-2018 in all areas of fundraising. In addition to student-involved fundraisers, the Spartan Music Boosters applies for grants and receives donations. Concert Program Sponsorship Ad space is closed for this school year. Program sponsorship will be offered again this summer for the 2018-2019 school year. The community is invited to join together and support your local Berthoud High School music program by purchasing a tax-deductible concert program support level for the 2018-2019 school year. Your sponsorship will help enrich the high school music experience for the students beyond what can be achieved through school district funding alone. Proceeds fund Mixed Choir, Show Choir, Concert Band, Marching Band, Color Guard, Orchestra, and Jazz Band at Berthoud High School.